It's been a little while since I've had the opportunity to open up one of these guys! This set came out in the 08/09 season, the year before I returned to the hobby. It features cards that look very much like the UD Canvas cards found in UD Series 1 and 2, except at a higher quality level. I was surprised to see these blasters available at dacardworld.com. I guess they were somehow able to find some old stock from someplace and acquire it. That's cool with me! I think this product is great fun to open. You'll see nothing but legends on high quality, canvas cardstock. The price has taken nice price drop to just under ten dollars. Last time I ordered one of these blasters it was about sixteen dollars. 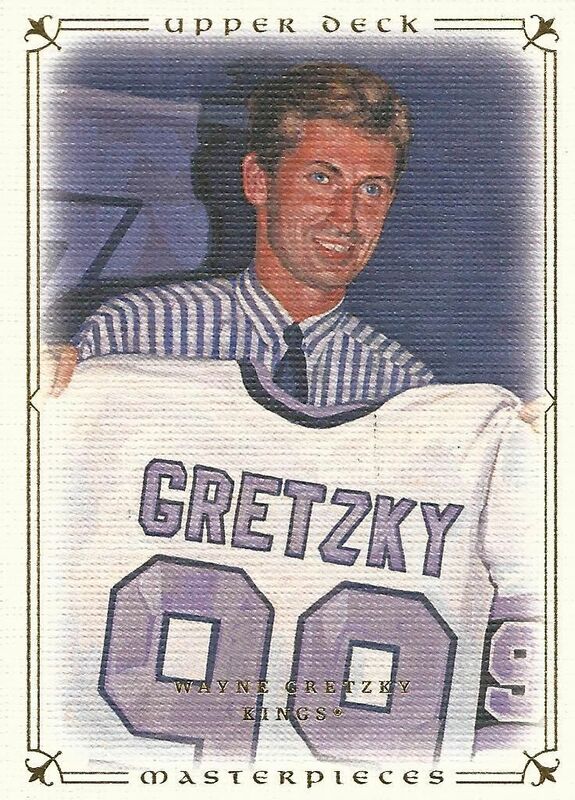 Looking back at my last break of this product, I was able to pull a jersey card out. Both jersey cards and autographed cards are available to be found in this product.I wonder if I'll be lucky again and get a hit! I remember the cards being a good quality, but these cards are definitely that and more. The canvas feel to the cards is really well done. The stock of the card is nice and thick. 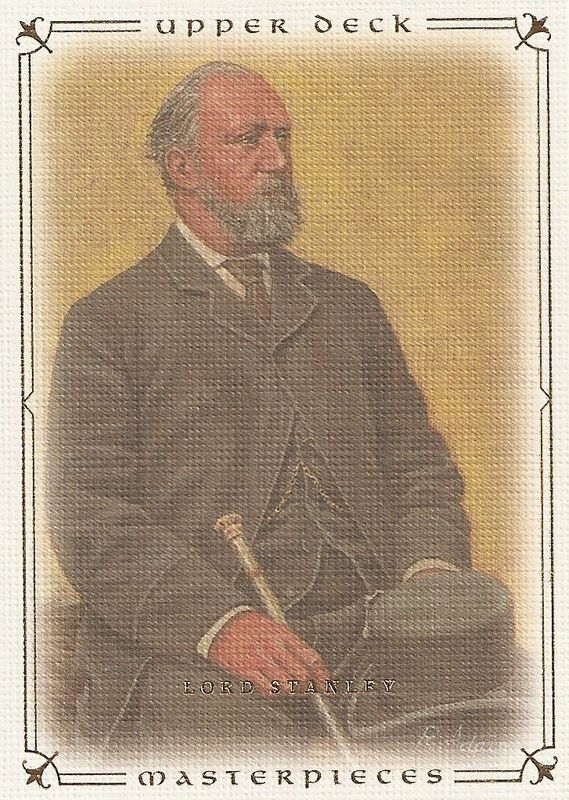 These types of cards just aren't seen that much in today's hobby - which is too bad. I pulled plenty of iconic hockey names in paintings that showed them in key moments of NHL history. 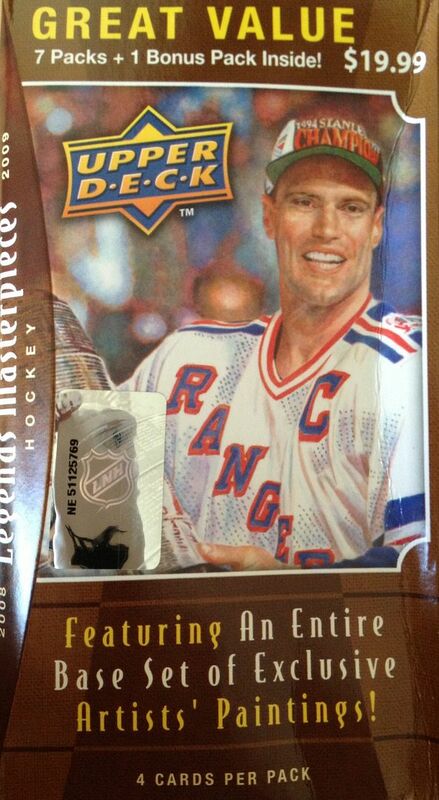 Being that this set only focuses on legends, there were players that I pulled multiple times, but with different images. I didn't get a hit in this blaster, but the brown bordered parallel card I got was pretty nice in terms of its build quality. The frame of the card is an actual border that is raised above the surface giving it a true framed picture look. Good stuff here! I actually pulled Lord Stanley in my previous break of Masterpieces, but I just had to put him into the top three again this time as well. He is such an iconic part of the game, but doesn't have much in terms of cardboard. Getting him is a fun pull. This is one of the most famous pictures of The Great One. It's his press conference when he was introduced as an LA King. Topps has a very famous card with this photo, and UD did a nice job of presenting it here with this portrait. 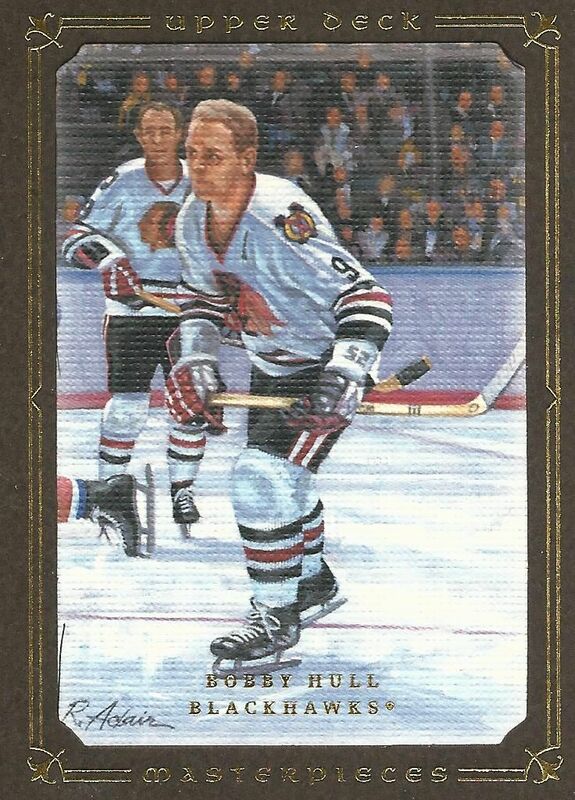 My only non-base card from the set was this brown bordered Bobby Hull parallel card. Brown bordered parallels are the easiest of all non-base pulls, but they still look great and are enjoyable to get. Although I didn't get a hit this time, these cards were a joy to look at and open. I think these blasters are a great deal and wouldn't hesitate to recommend them to anyone looking for a sweet little break. Their current price of under ten dollars would make a nice addition to any online order from dacardworld. I'm sure there isn't a ton of this in stock so you'd better hurry and get some before they are all gone! This is the set that got me into collecting again. I am not really a set builder, but I bought several blasters and a few hobby packs in an effort to build this set. Good review on a unique set.